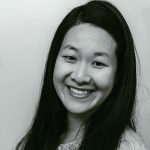 Published Oct 4, 2018 By Julia 6 CommentsThis post may contain affiliate links. 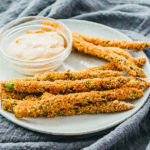 These asparagus “fries” are a fabulous low carb appetizer. You almost can’t taste the asparagus because it’s meltingly tender, surrounded by crunchy bits of savory breading. To prepare this, asparagus spears are trimmed, dipped in an egg wash, and coated with a low carb breading. Then they’re deep fried until golden brown in a pan on the stovetop or in a specialty deep fryer. It’s similar to my fried chicken recipe. 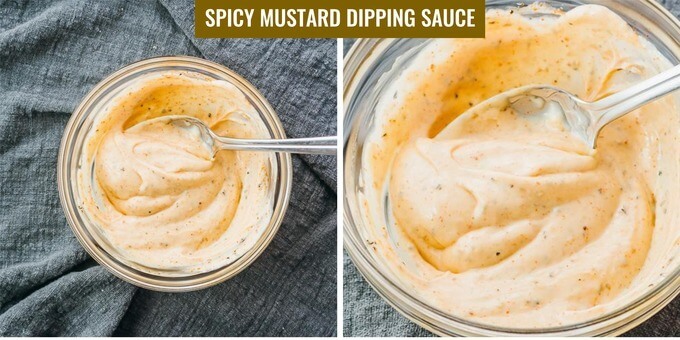 They’re great as-is, and even better when served with a spicy mustard mayo dip. Only 3.5g net carbs per serving of 5 asparagus fries. You’ll notice that the recipe says to dip asparagus in the egg wash with one hand, and the breading with the other. In other words, only one hand should ever touch the egg wash, and only one hand should ever touch the breading. Following this simple tip makes the breading process much cleaner and easier. I didn’t always do it this way, and I’d end up with fingers that had been breaded themselves! I prefer a single layer of breading; that is, one coat of egg wash followed by one coat of breading. I’ve tried double breading the asparagus, meaning that I repeat with a second round of egg wash and breading, and I thought that it made the breading taste too thick — I didn’t like it as much. But, it’s purely a preference. If you think the breading is too thin and want more crunch to every bite, you can try double breading. Just make sure you double the ingredients so that you have enough. The ideal dip for fried foods is something creamy and thick, as opposed to more watery and runny sauces. That way, the viscous sauce can easily adhere and doesn’t make your fried foods soggy. 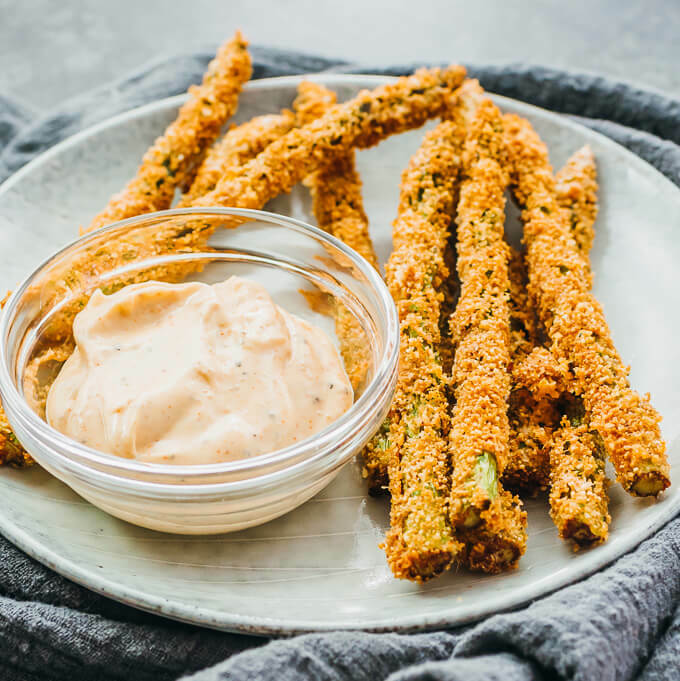 My favorite dip for these asparagus fries is a simple mustard and mayo dip with cayenne and black pepper, not too dissimilar to the dip for Instant Pot Artichokes. 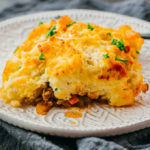 If you have a favorite dip that you think would go well with this, go for it and let me know in the comments section what you used. 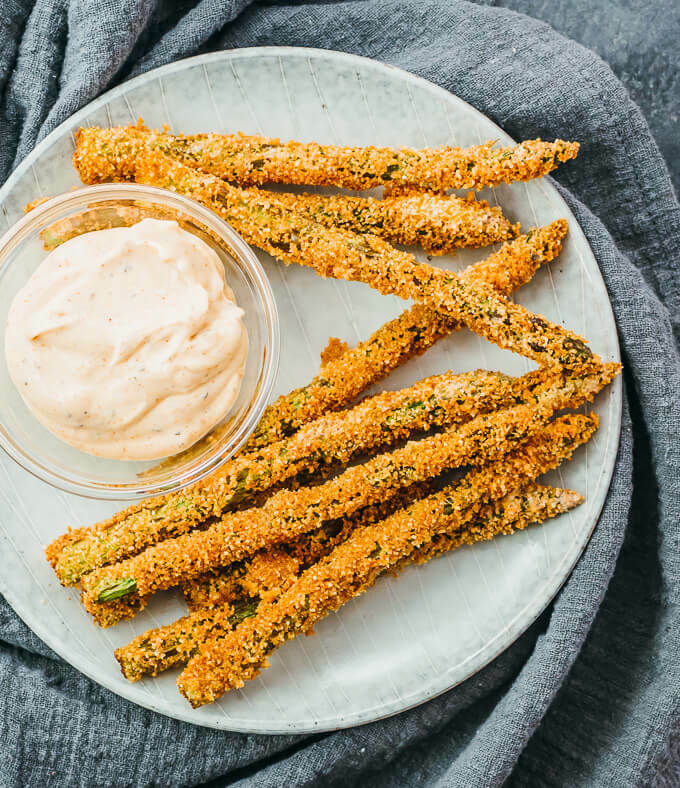 If you’d rather not prepare a dip, that’s totally fine — it’s purely optional and not required to enjoy these asparagus fries. 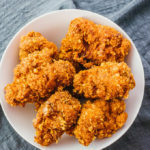 After making amazing keto fried chicken, I decided to take the plunge and bought a deep fryer. I love that it has automatic temperature control, so I no longer have to constantly monitor the oil temperature and adjust as needed. It also has an oil filtration feature, which is convenient for re-using oil. 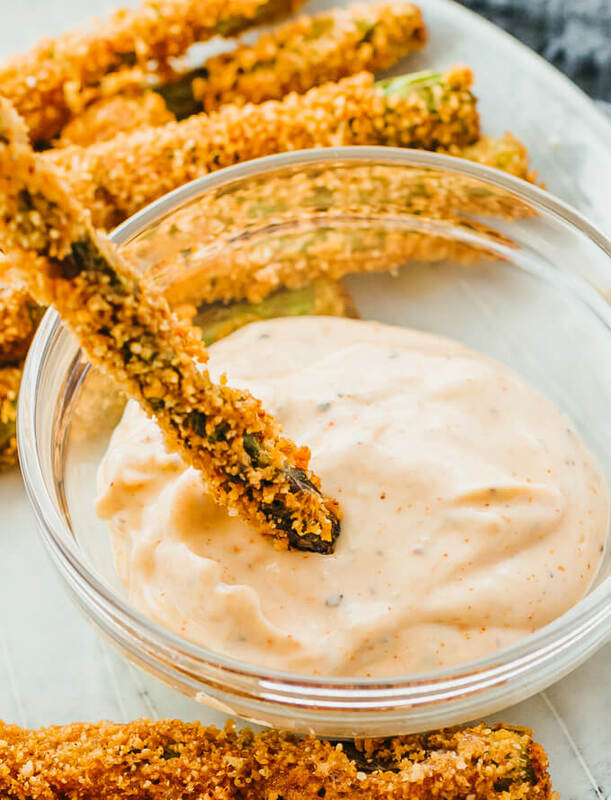 If you’re making this without a deep fryer, make sure you use enough oil so that the asparagus spears can be fried on all sides. Remember, this is deep frying not shallow frying, so you’ll likely need 1 to 2 inches of oil in your pan. You’ll also need an instant read thermometer to check if your oil is around 350 F, and adjust the stovetop as needed. As you add food to the oil, the temperature will immediately drop, so be vigilant about monitoring it. Otherwise, your cooking time might differ a lot from my estimates, and your fried asparagus won’t turn out as well. After trimming, the asparagus spears should only be about 6 inches long. Any longer than that, and it’ll be cumbersome to bread. Not to mention, you’ll need appropriately sized plates to hold the egg wash and breading for longer spears, and they’ll also taste tougher. 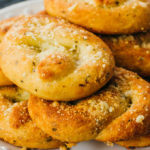 Use parmesan cheese that’s finely grated with a sandy consistency. 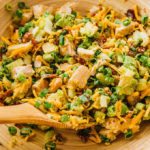 Don’t use the shredded kind, as they won’t easily stick to the asparagus. If your deep fryer or pan isn’t quite large enough to hold all of the asparagus spears simultaneously, don’t force it. Just work in batches. The last thing you want is to have asparagus spears sticking together and not properly frying because they’re overcrowded. 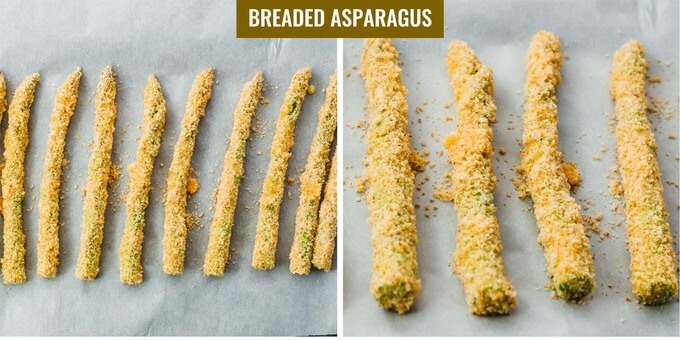 Note that the breading is kind of delicate, so handle the asparagus carefully after frying. I use a pair of tongs to move them around, which works well. In a small bowl, stir together all dip ingredients until well-mixed. Refrigerate until ready to use. Trim the asparagus spears by cutting off the tough woody ends so you’re left with about 6 inches. Rinse and dry them. In a bowl, beat together the egg and heavy cream until well-mixed. Pour the mixture into a shallow plate, large enough for the asparagus spears. In another shallow plate, stir together all breading ingredients until well-mixed. 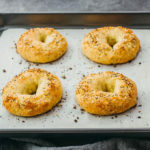 Using a deep fryer or a pan on the stovetop, add enough vegetable oil so that the asparagus can be fried on all sides. Heat the oil to 350 F. If not using a fryer, frequently monitor to maintain the temperature during frying. 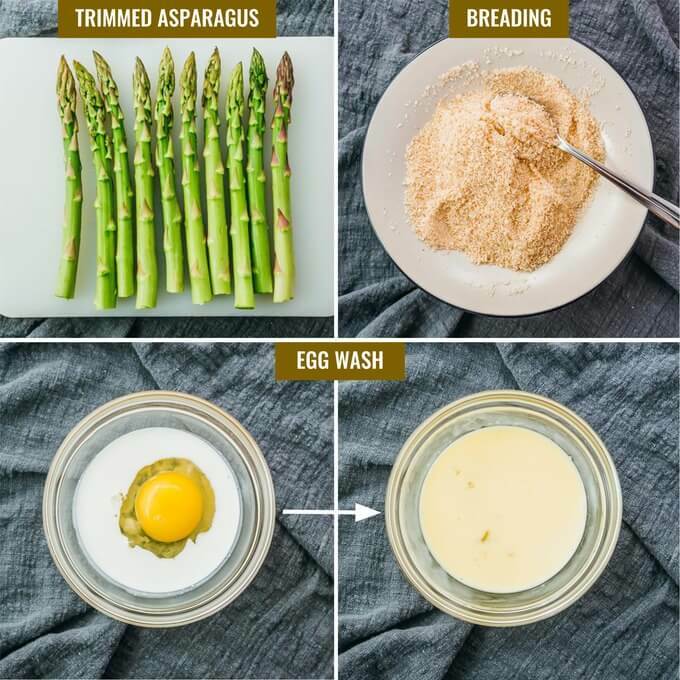 Generously coat each asparagus spear in the egg wash with your first hand, then in the breading with your second hand until well-coated on all sides. Gently shake off excess and transfer to wax or parchment paper. Repeat with the other asparagus spears. Fry the breaded asparagus until golden brown, 3 to 5 minutes, and drain on paper towels. You may need to work in batches to avoid overcrowding. After frying, handle the asparagus carefully so you don’t break off the breading. Serve while hot with the dip. 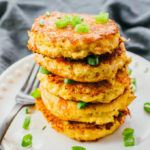 This recipe yields 3.5 g net carbs per serving (5 fried asparagus spears or 1/2 of the recipe). Nutrition info doesn't include vegetable oil used for frying. Could you do green beans the same way?? These all sound delicious especially the jalapeños. 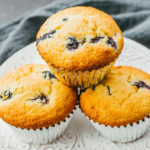 Our whole family loves those even the kids so definitely going to try.